The Unified Messaging feature allows users to retrieve voice and fax messages via My Messages on the My Phone dashboard, or via email. Voicemails are sent in.wav format, and faxes are sent in .tiff format. Optionally, notifications can be sent to a mobile phone via text or email. These notifications will not include the Voicemail or fax files. This article will provide instructions for administrators to configure the Unified Messaging service for a User. Please Note: Before the Unified Messaging feature can be used, the user must have a station assigned to them with at least one in-bound number. The following topics will help you with common Unified Messaging related questions. How do I configure Unified Messaging for a User? A. How do I configure Unified Messaging for a User? Click the My Site tab. Select the site from the list on the left. The My Site dashboard appears displaying quick links. Click on the User Features Tab. Click the user (anywhere in the row) that you would like to configure. Turn fax messaging On or Off. Select the number you want to receive inbound faxes for the user from the Phone Number drop-down list. Note: You must have an extra TN available to assign to faxing. Works for inbound fax only. Assign an extension for the fax number, if applicable. Select System Mailbox if you want messages accessed via phone or the My Phone dashboard. Check Message waiting indicator on phone, if applicable. Check External Mailbox if you want all messages sent as a file to the email you enter for the user: .wav for Voicemail, and .tiff for fax. Text to cell – Enter the mobile number and select the wireless provider from the drop-down list. Email – Enter the email address that should receive an alert when there is a message (Voicemail and fax). Check Send a copy of all new messages to another email address and enter the address, if applicable. Check Transfer on 0 to phone number and enter a phone number where callers can transfer from Voicemail by dialing 0, if applicable. Finally, in the Greetings section, select the type of greeting you would like to have played for callers. 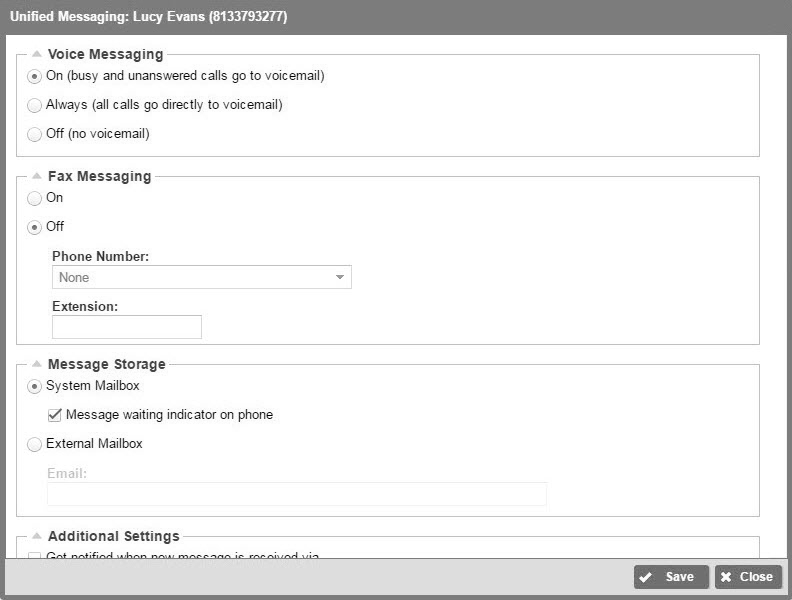 You can configure two types of Voicemail greetings – Busy and No Answer. You can choose to play a system default greeting or upload customized personal greeting. Greetings can also be recorded by dialing the Voice Portal (pressing the Message button on your VoIP phone) and entering the Voice Portal Password. 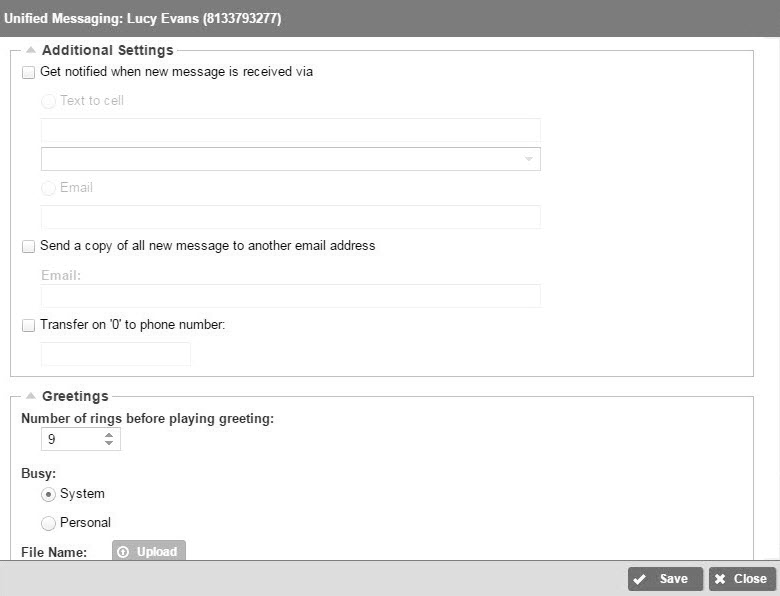 Select the Number of rings before playing a greeting before a Voicemail greeting is played. Click the Upload button and browse for the file on your computer. Please Note: All Voicemail greetings must be formatted as CCITT U-Law, 8KHz, 8-bit mono attributes as a .wav file. Select the file and click Open to upload the file.